Separately, they also claimed they were pressured into joining a government-backed union that has been deducting membership fees from the wages of those who are not official members, workers and an independent union said. 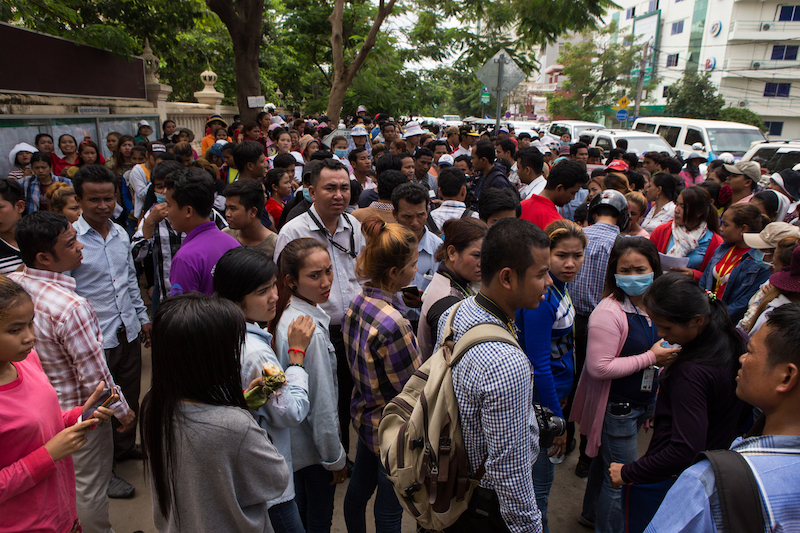 The workers from the Southland factory in Phnom Penh’s Pur Senchey district initially went on strike on Friday over obtaining leave to vote in Sunday’s commune elections, but extended the strike on Wednesday when news broke of the suspensions. However, Preap Munysovann, an official at CUMW, estimated that about 80 to 90 percent of Southland’s 2,000 workers signed the letter. Southland’s main international buyers are Polo, Next Co. and American Eagle, which could not be immediately reached for comment on Thursday. Mr. Munysovann said this week’s strike had made it clear that the union claiming membership of most of Southland’s employees, the government-aligned Cambodian Union Federation (CUF), was not on the side of the workers, citing their absence during the dispute. “CUF is similar to another kind of owner at the factory. They don’t want workers to protest or make demands,” he said. In March last year, Southland filed a complaint against Mr. Sina, accusing him of forgery when he misspelled two workers’ names on a document informing the company that the pair intended to form a union there. Houn Sras, a worker who had joined the throngs of protesters outside the Labor Ministry building yesterday, said that when she was hired by Southland in January, she was told by management to join CUF. However, she said she has been unhappy with the service. “The union never represents or helps us, but they always get along with the factory,” she said. Worker Chou Ny said CUF “has never been with us to help,” while Chhorn Phoen lamented that the $0.50 monthly membership fee deduction had not followed a signed membership contract. CUF President Chuon Mom Thol, who also works as an adviser to the Labor Ministry, could not be reached yesterday. A woman who answered a general number listed for CUF online identified herself as Mr. Mom Thol’s wife and said the union leader was currently in Switzerland. Ken Loo, secretary-general of the Garment Manufacturers Association in Cambodia, of which Southland is a member, said on Wednesday that preventing workers from forming or joining unions was illegal, as was the deduction of union membership fees from workers’ paychecks without proper authorization. “I would be quite surprised, because usually—even with the authorization—the factories are hesitant to make that deduction,” he said. Though it was “completely illegal” for unions to deduct membership fees without official approval, it is common, said Moeun Tola, executive director of labor rights organization Central. “It happens in most of the workplaces…. Some workers don’t know which union they are affiliated with or whether they are a member,” he said, adding that many workers are afraid of speaking up for fear of termination. “They confirm that their wage is deducted, and when we ask why they don’t notify management to stop the deduction of membership fees, they say they are scared to do that, normally because they are on short contracts,” he said. Mr. Tola said the issue was evidence of a lack of law enforcement, which was applied inconsistently to the industry—particularly among “yellow” unions, which are “company-sponsored unions” or “unions influenced by the employer,” and independent unions. “Red” unions are not affiliated with the government. “It is very confusing and very complicated, which union is yellow, and which is red. Some international unions don’t even want to talk about it,” he said. It was not just about education of rights, he said, as some workers did not trust that coming forward would yield results. “Sometimes the yellow union works closely with the management, so when you refuse to join the yellow union, the contract could be terminated or not renewed,” he said, adding that “most people are not brave enough” to file complaints. Esther Germans, program manager for Better Factories Cambodia, which failed Southland in a 2013 assessment of whether “workers are free not to join union,” said that her organization had reached out to CUMW and Southland over the dispute. “We know from visiting factories every day that issues around freedom of association can be complicated and unclear, and that a good investigation will need to take place before any definite conclusions can be drawn,” she said in an email. “Depending on how the case will unfold, we might take a closer look at the issue, in coordination with the union, factory management and brands,” she added. Neither Labor Ministry spokesman Heng Sour nor Southland’s general manager Mashiur Rahman responded to repeated requests for comment.